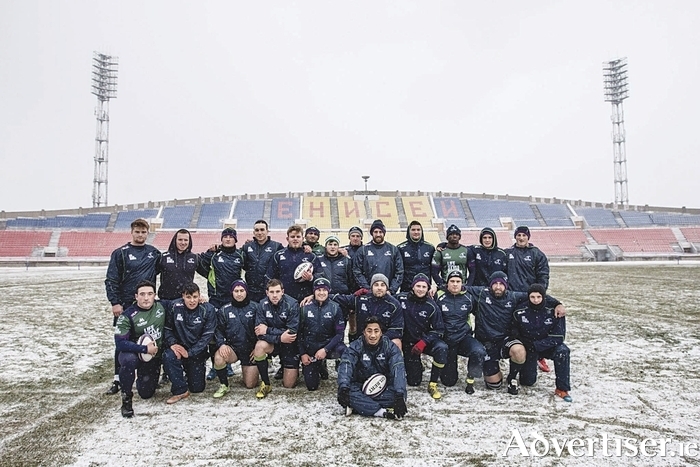 Game day in Siberia: The Connacht squad that took on Enisei-STM, temperatures of -26, a 12,000km trip through seven time zones, and three days delay - and still came out on smiling. It was a rugby trip like no other for Connacht last week, logistically, mentally and physically challenging. However came through their testing week in Siberia with flying colours, led by coach Pat Lam. The primary objective was to open their European Challenge Cup campaign against Russian side Enisei-STM with a victory, and that was achieved with a bonus-point 31-14 win in Krasnoyarsk's Central Stadium on Saturday morning (Irish time ), putting Connacht in pole position in pool one. That this was the first European match in Russia, involving Europe's most westerly and easterly teams, made it all the more special. And both clubs, led by their respective coaches, ensured the fixture was treated with respect and in the spirit of the game of rugby worldwide. Connacht's hardy supporters played their part too, making life-long friends with their Siberian counterparts. But if Connacht knew this fixture was always going to push the boundaries, they did not realise that the 6,000k trip into Siberia by charter flight would be one of the least problematic aspects, thanks to the careful planning and logistical fortitude by manager Tim Allnutt. More testing were the temperatures and conditions Connacht had to endure, playing in temperatures of -26 on a pitch that minutes before the kick-off had to be swept of snow. The Russians, even more used to those conditions, stop playing rugby in September. Yet Pat Lam is a leader who always takes the positives, and it permeates through the squad. Whether trapped in a lift for 15 minutes in the team hotel, or confined in airports for 60 hours, there is a 'get on and make the best of it ' attitude. The trip, Lam says, was one big learning curve for everyone, making people tougher. "You can look at the conditions and say: "No, I don't want to play," or you can look and say: "I'm going to overcome this." That Connacht overcame the freezing Siberian winter for 80 minutes comfortably is testament to this evolving squad. They led by 6-0 through Aj MacGinty's boot, and then took control of the second 40 minutes, finishing with a four-try flourish - wing Niyi Adeolokun crossing out wide, captain John Muldoon going over in the opposite corner after Bundee Aki had cut open the defence, a third from Darragh Leader out wide, and the fourth from Rory Parata from a well-executed MacGinty kick. "Half time the boys came in at 6-0 and could hardly feel their fingers, and I just knew the temperature was going to drop even further," said Lam. " We had a good chat - that we could put these guys away, but we needed to exert more pressure. All the tries came off some very good breakdown work. "We had said this trip was about growing our mental toughness, and just getting on with some of the challenges we were going to face. We had lot of obstacles in front of us and the boys knocked them all off, but the most important one was getting the performance." The paltry attendance never matched Enisei's belief of a sellout in the 22,000 seater stadium, and question marks remain over the wisdom of hosting a European match in November, two months after the Russian season ends. "I think the game needed to be played here, no doubt about that," said Lam. " For the Russian team, it was a monumental occasion and it's history, and if I were in their shoes, I would have been disappointed not to get a home game. But I definitely wouldn’t have the game there again in November, we would need to do this in early September or October, but that wasn’t possible with the World Cup." However Connacht were unprepared for what was to follow their victory as they waited at Krasnoyarsk airport to board their flight home on Saturday afternoon (Irish time ). Advised that an engine part needed replacing, it left the party stranded for another two nights at different hotels in the Siberian city, and, once out of the Siberian city, another night in Europe. Exacerbated by the closure of airspace over Europe due to the atrocities in Paris, Connacht's return was beset by delays, and as a result the Russian authorities needed to issue new visas in Moscow airport to allow the team to travel out of the country. Taking several hours to process, it allowed two groups to get away to Amsterdam and London, leaving nine members of the party stuck in Moscow on Monday night. 'I haven’t ever really encountered anything like this," said Lam." We have had flights delayed and things like that, but here we have had to deal with visas, delays, changing hotels, all in one go. Sometimes one or two of those things can happen, but not all together, and not so far from home." All three groups eventually returned home on Tuesday - via London and Amsterdam, and with just three days to prepare for the visit of Brive in round two, a light indoor session was planned for yesterday, a run out today, and a captain's run on Friday. "It's been a real challenge, and like a game, things change during a game, and you just have to adapt," said Lam. " I am pretty proud of the management and players - everybody got on with it. One challenge after another, one day we look back at it and say it made us tougher. "They are the challenges in life, and we have had a fair few over the last few days. Yea, a few plans have changed, but that’s life."